12in Philadelphia Brick Trowel. OX Tools Pro Philadelphia Brick Trowel is made with a solid forged steel blade for ultimate strength. Precision tapered ground blade. Images shown for illustration purposes only. 11in Philadelphia Brick Trowel. OX Tools Pro Philadelphia Brick Trowel is made with a solid forged steel blade for ultimate strength. Precision tapered ground blade. Images shown for illustration purposes only. Precision tapered ground blade. - Hard end handle for tapping in bricks. 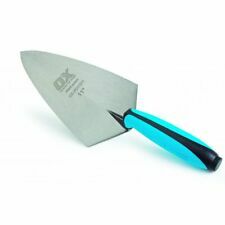 OX-P011210 Pro Brick Trowel Philadelphia Pattern 10in/250mm - OX-P011210. 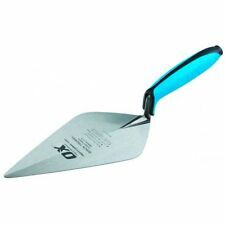 Pro Brick Trowel Philadelphia Pattern 10in/250mm. The Pro Brick Trowel Philadelphia Pattern 10in/250mm has a solid forged, precision tapered steel blade for ultimate strength. Hard end handle for tapping in bricks. Precision tapered ground blade. Solid forged steel blade for ultimate strength. OX Tools Pro 12in Philadelphia Brick Trowel 300mm Solid Forged Steel P011212. Condition is New. Dispatched with Royal Mail 2nd Class Signed For. OX Tools Pro 12in Philadelphia Brick Trowel 300mm Solid Forged Steel P011212. Condition is New. Collection in person only. OX TRADE BRICK TROWEL PHILADELPHIA 11"/280mm Bricklaying Spatula Wooden Handle. OX Trade Brick Trowel "Philadelphia" - 11"/280mm. Durable timber handle. Trade Counter Online are an Official OX Tool Distributor. The OX-T017528 Trade Brick Trowel Philadelphia - Wooden Handle 11 /280mm" is made from quality carbon steel with a timber handle. Being of the Philadelphia shape the heel of the trowel has sharper edges. Ox Tools T017428 Trade Brick Trowel London - Wooden Handle 11 /280mm"
The OX-T017428 Trade Brick Trowel London - Wooden Handle 11 /280mm" is made from quality carbon steel with a timber handle. Being of the London shape the heel of the trowel has rounder edges. The London shape is better suited to lay bricks because of the smaller surface area available for mortar and precision. Ox - P011211. Ox Pro Series Brick Trowel. 11" Trowel. Ox - P011210. 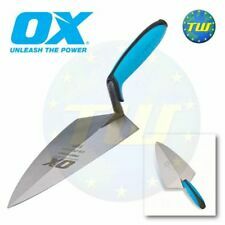 Ox Pro Series Brick Trowel. 10" Trowel. Chain Saw Chains. Ending Soon. New Arrivals. Orders are dispatched on one of the following services Well balanced & perfect flexibility. Hard end handle for tapping in bricks. Ever Build. Precision tapered ground blade.